Coll. No. 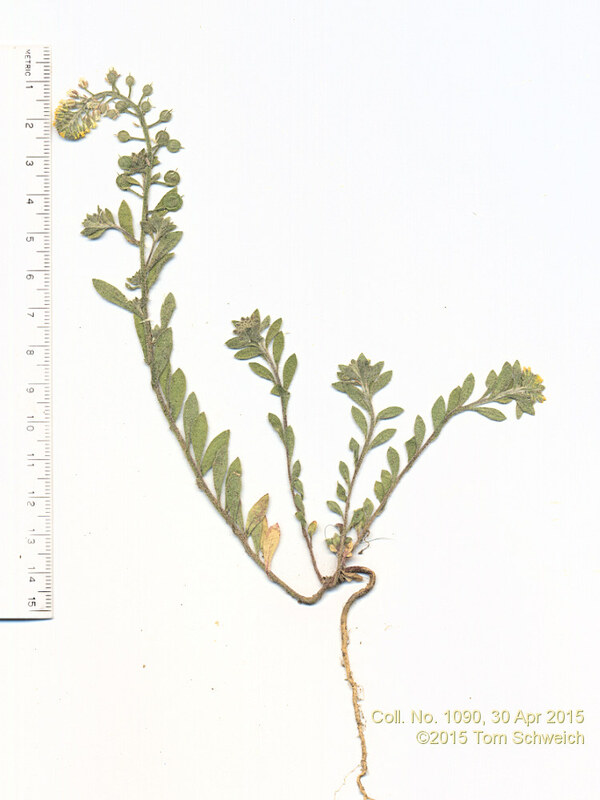 1090, 30 Apr 2015, characters observed: Annual, tap-rooted, to 15 cm., stellate hairs throughout (typically doubly branched and 8-pointed); Leaves, cauline, 14 mm. × 3.5 mm., oblanceolate, margin entire, tip acute, sessile or vaguely short-petioled; Sepals, 4, 2 mm., deciduous in fruit; Petals, 2.9 mm, yellow fading white, tip slightly notched; Stamens, 2.6 mm. ; Filaments, 2.3 mm., winged proximal 1.8 mm. ; Fruit, round, 3.5 mm. dia., margin entire, compressed parallel to the replum; Ovules, 4 (most keys and descriptions say "2" when they give a specific number, but the genus is described as having 1-2 ovules). North Table Mountain Trail, City of Golden, Jefferson County, Colorado: n end of trail. Field Notes: Coll. No. 1090, 30 Apr 2015. Other photos about Species - Brassicaceae or Brassicaceae Alyssum simplex.